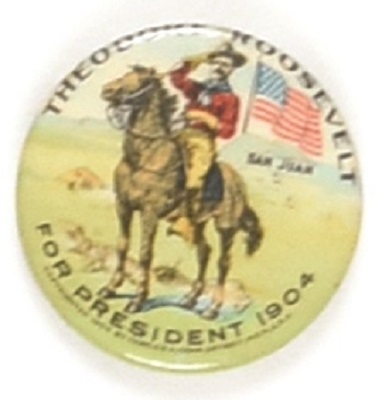 Theodore Roosevelt gives you a sharp salute on this classic and colorful campaign pin. TR made a name for himself at the Battle of San Juan Hill in Cuba and this pin shows him in all his martial glory. This rare pin is a true “must-have” item for any great collection, excellent condition. Treuman Katz collection.